NYFW 2019 is almost upon us. You will find lots of information online about the many designers who participate in NYFW and that is exciting information. However, before the first models walk down the runways with their gorgeous fashions – the hustle and bustle that goes on around and before are every bit as intriguing! 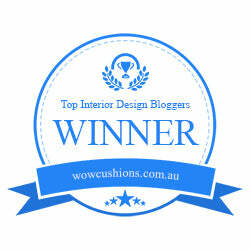 The excitement abounds backstage as well with last minute touches and hopeful designers. Hair is getting its final inspection and the excitement mounts as the time draws near. Designers, models, and makeup artists go hand in hand this week. From designer to designer, the looks are created by the makeup artists exclusively to enhance the designs worn by the models. Here are two examples that show a contrast from a colorful fantasy look to neutral classic glam look. 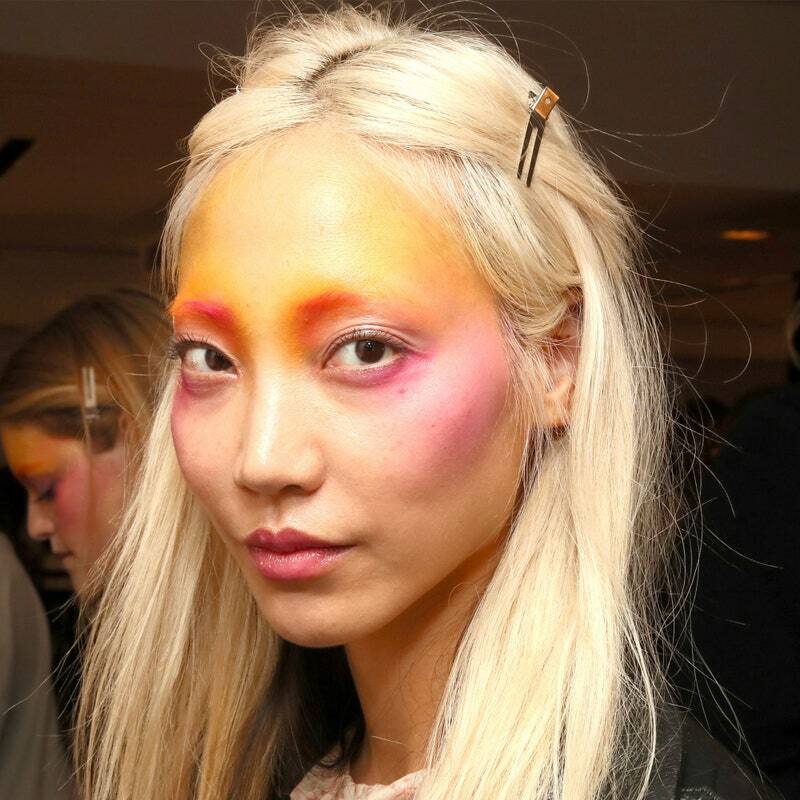 Model Soo Joo Park shows a colorful, fantasy look with a holographic twist on no-makeup makeup. Strokes of pink, purple, yellow, and orange wash together along the eye for a watercolor effect. A light tapping on the lips of VR Fire Opal from the Pat McGrath Labs Mothership V: Bronze Seduction Palette rounds out this look. Head wraps in neutral colors with eyes on display describe a bit what you will see from this designer. The makeup artists layers rose over twinkly and matte shades from the Tom Ford Eye Color Quad in Golden Mink with lots of mascara worn with sheer lip color. Many think this is the most interesting part of fashion week. The fashion excitement explodes as multiple streets are closed off to through traffic while the intersections become runways for street fashion. To give you a flavor of what this is like, here are some street styles from NYFW 18. For winter warmth you will always win with these neutral colors of greys and tans. These classic double-breasted coats are traditional yet fashionably modern and you can be sure that a little rain in the streets of New York City will not stop these fashionistas from showing up in style. Check this smashing reddish-brown leather coat alongside the classic camel hair double-breasted coat for amazingly stylish winter warmth. Is it ok to use the phrases “suave sophistication” and “saucy red and black” for the same ensemble? 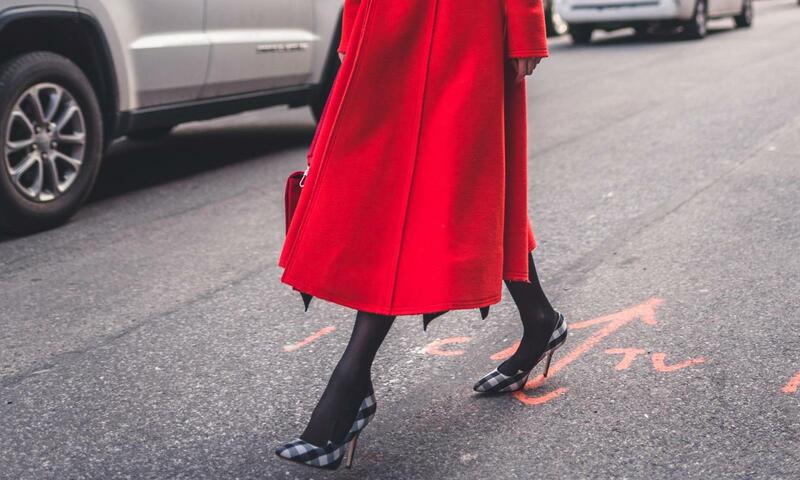 Apparently, it is with this mid-calf length red coat, a matching red bag, and black tights with black and white checkered stiletto heels. I love these bright, trendy colors that these models wear underneath their big, casual coats for a bright mid-winter statement that says, “winter street fashion rocks”! If you have never visited New York City Fashion Week, maybe this is the year for you. So, make your reservations and get out there and enjoy this very special fashion event.